Ansonia’s Shykeem Harmon avoids a tackle attempt by Watertown’s Rich Ojeda Thursday at Jarvis Stadium in Ansonia. For a split second it appeared as if an Indians’ defender had the Chargers quarterback wrapped up behind the line for a sack. Instead, the junior wiggled free and just kept on going — bouncing off a downfield tackle attempt all the way into the end zone. 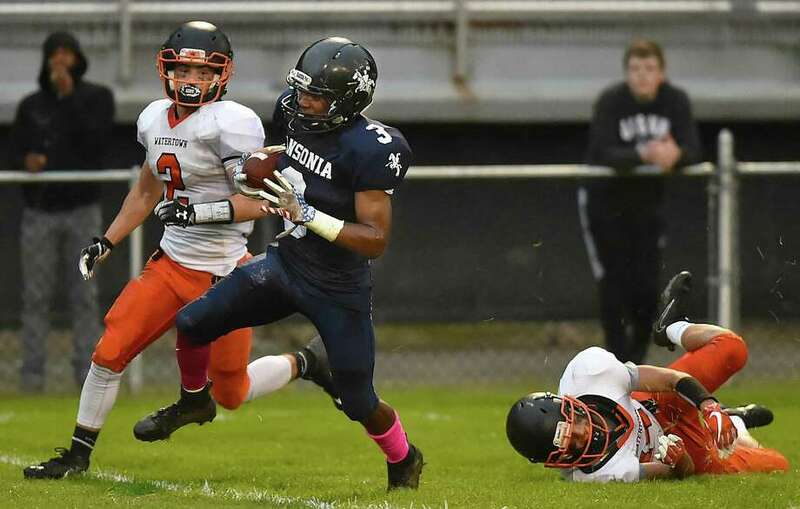 The rest of the hard running Thursday night for undefeated Ansonia went to Shykeem Harmon, who scored three touchdowns. Harmon racked up 219 yards on nine carries, including touchdown runs of 82 and 29 yards. If not for his one-yard touchdown plunge — which made it 41-0 before the half — his average yards per carry would’ve finished at 27.5. The junior halfback — and the majority of the Ansonia starters — called it a night after the first 24 minutes. The Chargers improved to 5-0. “We came in with a chip on our shoulder, the first few weeks we haven’t been playing good,” said Cafaro, who also threw a 44-yard touchdown to his brother Garrett. Ansonia’s lead swelled to 27-0 early in the second when Jy’mere Jones took a reverse handoff from Harmon behind the line of scrimmage. Jones then sped around the corner and went untouched up the left sideline for a 52-yard score. Watertown (0-5) got on the board early in the third quarter thanks to Samuel St. Hilaire’s 38-yard run. The senior also broke off a 40-yard run late in the first half to lead the Watertown offense. Shykeem Harmon, Ansonia — Three touchdowns and 219 yards on the ground. Not a bad night at the office. The teams combined for 12 penalties in the first half, many procedural calls at the line of scrimmage and finished with 16 total.